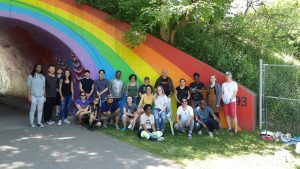 On Saturday, June 16th, 2018 Mural Routes staff and students from this year’s Mural Art Career Development program helped in restoring vibrancy to the iconic Rainbow Tunnel near the Don Valley Parkway. The mural was originally painted in 1971 by Bc Johnson, and was restored by Mural Routes in 2012, adding a mural to the inner tunnel and north-facing side in 2013. Mural Routes now maintains the mural regularly. The original artist, Bc Johnson, is still in touch with Mural Routes and helped sponsor this recent maintenance work. 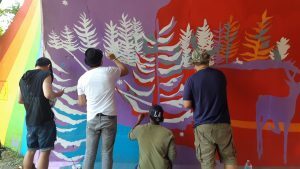 Led by lead artist Rob Matejka, the team of 25 worked all day, scrapping, priming and repainting the mural. This project provided hands-on experience for students to practice their skills and techniques they have been developing over the course of the Career Development program. 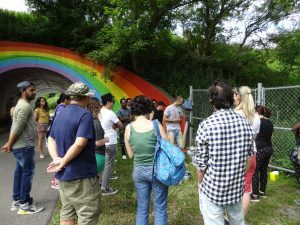 Moreover, the maintenance at the DVP Rainbow Tunnel provided a day of great energy and community building. 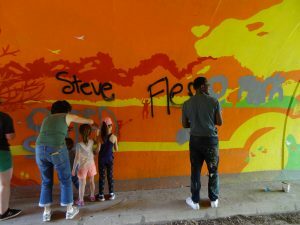 As work was underway, walkers with dogs, cyclists, children and families, stopped by to chat with our muralists and in some cases, were given a brush to help with the touch-ups! 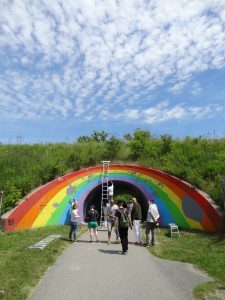 By the end of the day, the Rainbow Tunnel appeared fresh and as if new again. 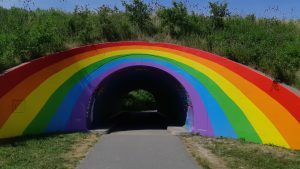 More posts about the Rainbow Tunnel can be found here.